Do not underestimate this course. 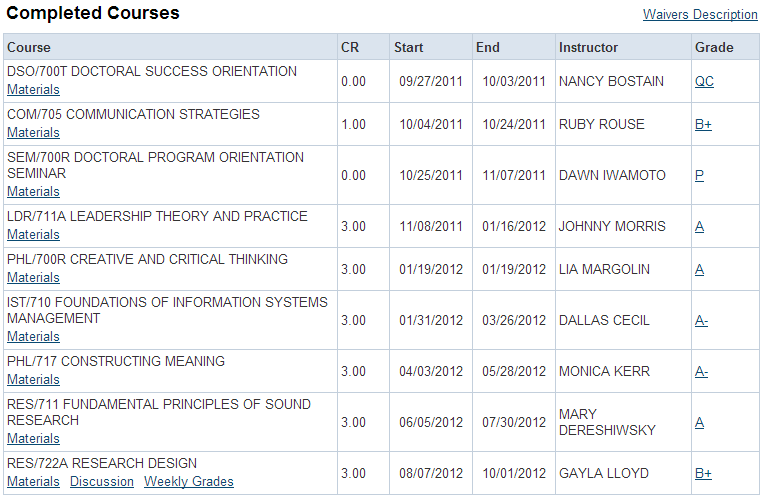 This was the second most difficult course I had to take in this program so far. I thought I was going to fail it to be completely honest. I called my academic counselor just because I felt the teacher was grading very harshly and required some elements I was not used to. Anyway, I passed with a B+ so I am very thankful that the teacher accepted the resubmitted essays. I redid my proposals three times. The first time was of my own accord. I wrote about what I know and have experience in but I had to ask myself if I really enjoyed what I was writing about. The answer turned out to be no. So I redid my paper. Knowing the risks, I did it anyway. That paper was scrutinized so much, but I couldn't revert it. After all the feedback, it turned into a third version of the paper. At least now I know what to expect. For this reason, it is important to know what to write about ahead of time. This course is also considered to be the end of the first year in the doctoral program. I guess they wanted to give me food for thought before I go into my next residency (I delayed it to next year). 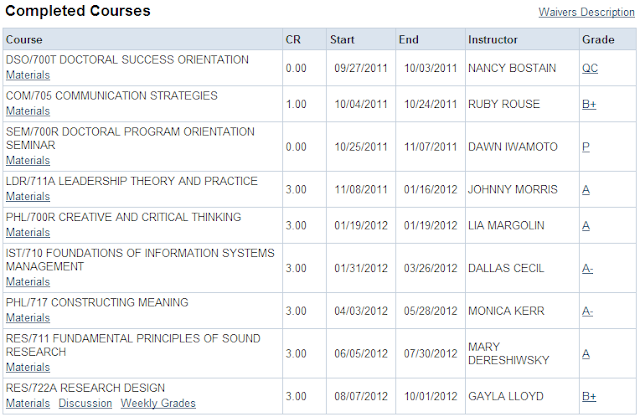 You can easily tell by my grades which courses I had the most difficulty in because they each have a B+ grade. Just so the readers understand the severeness of the program, if I drop below an 80%, I will need to either retake the course or I will get dropped from the program. Believe it or not, the courses are very strict and Phoenix has higher standards than one might assume. Why is it important to review literature before identifying a research problem? We were asked this in our prior course as well and my answer is pretty much still the same. It is very important to review the literature before identifying a research problem in a study for several reasons. It is the researcher’s responsibility to review and interpret to the literature and writer’s perspective to grasp and understand the research (Willis, 2007, p. 160). Reviewing the literature also helps us as students, researchers, and future doctors/professors to understand possible perspectives from others as well. Reviewing the literature also allows the researcher to ask questions towards the aspects of the literature that does not make sense or that appear to be assumptions (Willis, 2007, p. 162). Most importantly, reviewing the literature is important for ethical and factual reasons. Comparing literature with other literature to verify that the data is replicable can be an important aspect towards gaining knowledge in that area. Any questions or perceptions on the literature should be followed up by the actual data presented and proven in the literature. How does a researcher identify or recognize a problem that is appropriate for doctoral research? Problems can be found in everyday situations. Whether a person has a problem with their health to whether someone has a question about some aspect of their life, problems will exist through every day lives. When this occurs, people may look for help from experts in the field (Christensen, Johnson, & Turner, 2010) and there are many ways a researcher might recognize a problem. One way a researcher might identify a problem is through asking for advice from an expert in a given area (Christensen, Johnson, & Turner, 2010). This allows the researcher to ask questions and obtain valuable feedback from someone who is knowledgeable in the environment or scenario of the study. Obtaining information through an authority can be risky. Although the expert may have information that is to be perceived as truthful, the information may not necessarily be factual (Christensen, Johnson, & Turner, 2010). This information or feedback from the expert may need to be verified with the use of reviewing literature and possibly going to other experts for further validation (Christensen, Johnson, & Turner, 2010). Christensen, L. B., Johnson, R. B., & Turner, L. A. (2010). Research methods, design, and analysis (11ed.). Boston, MA: Allyn & Bacon. In this week, I have learned a little bit more about why reviewing the literature is so important and how to recognize what the problem statement is in the literature. I have also learned about what I will probably focus on as well to help me complete my dissertation. This aspect is something I have been struggling with for a while. I think it will be best for me to start with writing about the areas that I have experience in and maybe later expand into areas of study I would like to discuss and explore. I'm not sure if this is the path that is normal to take but I will try to do the best I can to succeed. What are common practices to avoid when writing literature reviews because they are forms of plagiarism? What should be done instead? Some of the common practices that we may need to avoid is using the library as our only resource for finding information in the study we are researching (Neuman, 2005). If we are going to use library resources, we should consistently cite and reference any material that we derive from the library. Another practice we should avoid is copying someone else’s data collection information. If the researcher uses information from the assistant or an associate, they need to reference that person in the study otherwise it is considered plagiarism (Neuman, 2005). This is especially applicable when the researcher uses the same exact words or phrases (Neuman, 2005). To avoid plagiarism, as doctoral students and as researchers (future and present), we should try to give credit when we use someone else’s sources. By asking for permission, citing, and referencing the alternative sources, we are ensuring that our work is valid and ethical. We should try to make sure at all materials and data resources in the study are used correctly and accurately. Neuman, W. L. (2005). Social research methods: Qualitative and quantitative approaches (6th ed.). Boston, MA: Allyn & Bacon. What are some advantages of writing good annotated bibliographic entries? What is the value of annotated bibliographies? One of the advantages to writing a good annotated bibliographic entry is that we have the benefit of a summary that we can go back to at a later date and still know and remember what the article was about after reading it (Leedy & Ormrod, 2009). Many times I will forget what an article or book was about or what the point of the research was. This will allow me to go back and find out. What is the value of annotated bibliographies? The data in an annotated bibliography is very valuable, especially if we need to go back and use the article as a reference multiple times. It includes the name, title, where the journal is from, our thoughts and ideas from the article, and what the article is about. Also, when I find really good articles that I want to use for my dissertation, I can put them into a group so that I can reference them again. Leedy, P.D., & Ormrod, J.E. (2009). Practical research: Planning and design (9th ed.). Upper Saddle River, NJ: Prentice Hall. In this week, I have learned about some of the common practices to avoid plagiarism. It is still amazing to me that there are several ways that people may not even realize that they are plagiarizing. I have to admit that I might have made some of these mistakes if I didn't learn about them first. Thank goodness I got the information I needed before that happens. Another thing I learned in this week was the advantages of writing a good annotated bibliography. I already knew about how this aspect can be very helpful but having it available for future use will be even more valuable later when I have to go back to find these articles and use them as references. How does the statement of the problem provide the foundation for the rest of the study? The problem statement provides a great foundation about the study as it pinpoints much of the important aspects of the study. Utilizing a problem statement allows me to explore the different possibilities and outcomes of a study (Christensen, Johnson, & Turner, 2010). It emphasizes what the study is about, how I am approaching the problem, and the reasons behind the research. It allows me to look at several issues that we may face, and through analyzing research, I can become more informed about the ideas and techniques that are used for the studies. I also recognize the theory behind the problem statements to clarify what is happening in the study as it helps to identify what the problem is and how to go about following the methodology of the study. Why is it valuable to discuss why leaders and other stakeholders might care about solutions to the problem described in the problem statement? It is valuable to discuss the problem statement for leaders to care about the solutions to allow more information that is verified to promote even further and thorough research. Other stakeholders may also need to be concerned about the accuracy of the problem statement, as a lot of time and money may need to go into the study. So the information in the problem statement needs to be clear, accurate and proven otherwise it is difficult to know is the information is true or not (Leady & Ormrod, 2010). Concepts such as definitions, terms, and phrases need to be clearly defined for the research as well so that there is clarity in the study. This study may also need to be distributed by the stakeholders and their reputation may be at risk if the information is not clear or proven (Leady & Ormrod, 2010). The information within the problem statement is an important aspect for both the stakeholders and leaders. In this week, I have learned a lot more about the importance of what a problem statement is and how it affects our study. I have also learned that the problem statement should be as specific as possible to ensure accurate information as well as valid information. In addition to learning about the problem statement, I have also learned the different perspectives of why the problem statement is important for leaders and stakeholders as well. What do you find most challenging or difficult in describing a researchable problem in your field? Why? I believe that there are so many things I can pick and that is one of the aspects that is difficult. If I need to be specific, my selection should also be specific. So I become conflicted at times when I want to talk about problems in my field. There are so many perspectives one can take in Information Technology and Systems that it can almost be too much of an information overload. I also want to have the researchable problem to be something important and something that people care about or want answers to. I want the information to be meaningful and helpful to others as well. That's why I find it both challenging and difficult to be very specific when I have so much information to share and so much I want to investigate. Please respond to the following question for Week 2 DQ 2. What challenges did you face when revising your Week Three problem statement? I must admit, I almost felt like I needed to redo the entire thing after some of the comments I saw. I do appreciate all the responses that I received. I will probably work with this as my peers definitely gave me plenty of very good advice. So one of the things that I need to improve on and have is a better declaration to my problem statement. I need a definitive statement on what the problem actually is and to outline that well enough so that others understand the problem and point. Another one of my challenges is that I need a better understanding of the elements that are needed in the problem statement. I think with practice comes a better ability and understanding towards making the problem statement more comprehensible and specific. I think also taking the criticism hurts my ego a little but I will get over it. In the end, if I can learn the most important aspects of these challenges, I will feel that it is all worthwhile. I have learned that there is much to learn about writing a problem statement. I wrote most of my essay like I would a typical review when I should concentrate more so on the perspectives of what I believe the problem is. I learned a lot of information from both my peers and my professor on what I need to look into when writing the problem statement. Now that I know much more, I will continue to try to work on my problem statement until it is good enough for the dissertation. How would changing the purpose statement of your research proposal change the focus of your study? Provide examples. The purpose statement of the research study is used to keep the research clear and on target of what the study is going to be about (Leedy & Ormrod, 2009). By changing the purpose statement of the research proposal, it changes to focus of the study. For example, if the researcher is writing a study about web technology and the purpose statement of the study is changed to web development, the entire study will need to be in line with the change and the focus of the study has changed. The same thing occurs when the title is changed (Leedy & Ormrod, 2009) as it affects the reader's understanding of what the study they expected to read is about. Both the title and the purpose statement should follow the same pattern as the researcher should focus their data around those two elements. What is the difference between a problem statement and a purpose statement? What might be some appropriate purposes for each statement within doctoral research? The purpose statement is the focal point of the ideas and overall study whereas the problem statement is the information that describes what the issues are that the researcher wants to discuss in the study. In the purpose statement, the information is presented with the ideas and focus of the study. The purpose statement may also be one of the first elements to begin the study as well as the title (Leedy & Ormrod, 2009). The problem statement has information about what the researcher is going to discuss and about the problems within a certain area of the what will be discussed in the study. Both of the statements need to be focused on what the study is about but the problem statement needs emphasis to information that allows the researcher to appear to be writing a study with an open mind (Leedy & Ormrod, 2009). In this week I have learned about the purpose statement and the differences between the purpose statement and the problem statement. The purpose statement should be clear and to the point so that the focus of the study is created around that. If the purpose statement is changed in any way, the focus of the research proposal is also changed. I have also learned that the purpose statement is one of the most important aspects of the study as it distinguishes the study's goals and objectives. How do research questions frame and guide studies? According to Christensen, Johnson, & Turner (2010), research questions are applicable to test and data collecting to address information that is important to the study. We need to be specific and clear on what the research questions are about so that the data received is to the point. If the questions are too vague, the investigator may not know what to look for. The research questions provide the necessary ideas and information that guides the study's topic and details. The research question also allows the researcher to plan what will be in the study. The research design is the outline to the research question (Christensen, Johnson, & Turner, 2010) that is used in the study. The research question also identifies the relationships in the study and so the research question not only helps as a guide but as a frame for the study as well. What type of research questions would lead to a qualitative study? To a quantitative one? How would the wording differ? Discuss these questions relative to your field of study. Qualitative research questions need to be clearly stated and descriptive. Two examples of qualitative research questions are "‘What is worth knowing in our profession?’ and ‘Which research tools are most appropriate?’" (Jongh, 2012). These questions are based on the information that the researcher wants to evaluate as well as the guideline for what the study will be about. Quantitative research questions need to be concise and analytical. An example of a quantitative research question would like this: What is the frequency of quantitative studies available in information technology field in 2011? (Wisdom, Cavaleri, Onwuegbuzie, & Green, 2012). This question is based on information that researchers can examine using a measurement. Both of these questions are applicable towards information technology as the questions are about the profession and tools needed as well as studies that have occurred in information technology. Jongh, J. (2012). Undergraduate occupational therapy students' engagement in qualitative research: identifying research problems and questions through reflection while in a community fieldwork setting. South African Journal Of Occupational Therapy, 42(1), 35-39. In this week, I have learned that research question frame and guides are a valuable part of the direction. The research questions help us as doctoral students learn which way the study that we are creating should be going. The research questions are used as tools to help us develop our study and keep on target. I also learned that studies are typically designed around the research question so this is a vital element that we need to understand. What factors are most important to you in determining a research design? The response should be relevant to your area of interest. The “research design” is “the outline, plan, or strategy used to investigate the research problem” (Christensen, Johnson & Turner, 2010, p. 232). The limitations when determining what are needed for the design of the research is a very important factor. Developing the strategy is necessary for research with information technology. For example, if I were to analyze how the computer systems are structured in a classroom environment, I would need permission from the school and a plan of how I can derive the information from this environment. I would not be able to simply go into the school that I may not be familiar with and go into any room, especially if there are classes in session. So it is very important to come up with a strategy and finding out what my limitations are in this type of environment first before I delve into it. What are the pros and cons of selecting an established theoretical or conceptual model or framework? What are the pros and cons of developing your own? Pro: The model will help in “describing how a set of variables are related” (Christensen, Johnson, & Turner, 2010, p. 47) and uses the beliefs to support the data. The framework “helps if it is used in a flexible manner.” (Neuman, 2005, p. 461). Con: The relationship of the data can only be supported from the data through beliefs rather than gathering organized data to support the relationship of the variables and “if there is an error in conceptualization, it could be in any of a number of categories” (Christensen, Johnson, & Turner, 2010, p. 90). Pro: The model helps in conceiving an idea to develop into “a more concrete, measurable form” (Neuman, 2005, p. 174). The theoretical framework is specific and organized. Con: The theoretical model is not flexible and is very specific. Pro: In developing my own, the framework may be flexible enough to support the data of my study as well as explore other newer ideas that may not have been used before. Con: In developing my own framework or model, there may be inconsistencies or problems with the flow that leads to the proven data. In this week, I have learned many different things. I learned about what some of the limitations are in research design and the importance of how it affects the study. I also learned what some of the pros and cons are in theoretical and conceptual frameworks and models. I think the most important things I learned this week and the prior weeks is the construction of the elements needed in a study. The research problem, purpose, and questions are elements that I will need to practice in my formulation of my essay but little by little, I will understand it. No essay in this week. What are the most important parts of the research concept paper? Why is alignment across all elements of a concept paper important? The most important parts of a research concept paper are the problem statement, the purpose statement, and the research questions. The research problem emphasizes the issues that will be discussed in the study. The purpose statement develops the information from the problem into a coherent descriptive idea and asserts the direction of the study. The research questions relate the content of the research problem and purpose into an easy to understand segment of the paper so the reader knows the questions involving the study. It also provides a brief overview of the reasons for the study. The ideas in each element must be clear and concise as well as high-level and constructed well. All of these elements are important parts of the concept paper because the elements drive the study in a direction that the researcher is trying to discuss and help the researcher to organize the data so that it makes sense to the readers (Leedy, & Ormrod, 2009). What is the difference between a concept paper, a research proposal, and a research report? Why do you think the concept paper includes certain aspects of Ch. 1 of the dissertation proposal but other aspects of Ch. 1 are excluded from the concept paper? A concept paper is different from the research proposal and a research report in that the “purpose in developing a concept paper is to capture the interest” ("Writing a Concept Paper", n.d., p. 1) of the mentor or sponsor. The concept paper also reflects the student’s or researcher’s ability to present his or her ideas in the concept paper ("Writing a Concept Paper", n.d.). The research proposal gives evidence of issues that relate to a community, society, or requires evidence that requires research and inspection (Christensen, Johnson, & Turner, 2010). In the research report, the information between the content and the logic should contain information derived from resources other than our own to provide a relationship between our writings and our resources (Christensen, Johnson, & Turner, 2010). This class has been extremely hard for me but at the same time it is one of the more enlightening courses I have encountered so far in the doctoral program. I think this is one of the courses I should have gotten when starting out in the program because of all the elements that are discussed to create a concept paper. I believe I have a much better understanding of most of the concept paper requirements. I will need to practice. colleagues to grasp the concepts shared. Onward and upward is our goal. any questions. Have a great day! definitely different from other papers that you have had to write in the past. the future. Onward and Upward is definitely your goal. research methodology and design as the overall basis of your dissertation. vastly approaching the end, so keep your head up and you will make it. worthy of a scholar-practitioner. Onward and upward is our goal. approaching the end, so you're your head up and you will make it. I will seek answers for you. Have a great week! I have completed grading your Week 5 resubmission and placed your rubric here. week. Thanks for all of your help. Your postings and paper have been good. know the answer, I will seek answers for you. Have a great week! in the classroom with respect to our Week five objectives? Onward and upward! DQ 1 post on one day. Then on the next day make 2 posts in reference to it. guidelines so that you can receive the quality points. I have completed grading your Week 4 resubmission and placed your rubric here. you as we move forward to week 5. Onward and Upward is the ultimate goal. of 7 days. You posted 1 substantive message on 8/25, 2 on 8/26 and 2 on 8/27. may help you to better meet this requirement: Make your DQ 1 post on Tuesday. meet the course requirements. Please keep in mind this is only a suggestion. You may handle it any way that you wish, just as long as you meet the mandate. Then I can award you full credit for all of your posts. know if you have any questions pertaining to our course material. classroom management skills, and responding to your peers in a timely matter. this week with thought-provoking and relevant material. Keep up the good work. As mentioned before, please be sure to web your experiences in your responses. for this week. I am looking for bigger and better things as we move ahead. on bringing in information from your weekly readings for all your DQ responses. this week are unclear to you. substantive messages on 3 out of 7 days this week. Thanks for being an active part of our class. together. We are off to a great start. Keep pushing forward.